A car accident is a nightmare for any victim, but new developments in transportation have added a new layer of complexity to some accidents. Rideshare services like Uber and Lyft continue to change the way that accident victims must deal with the aftermath of an accident. These rideshare apps add more options to transportation and often lower the costs of a daily commute, but at the same time, they are fraught with additional complications that often leave people not knowing what to do after they’ve been involved in an accident involving a rideshare service. As a personal injury lawyer in Los Angeles, we have great respect for the accident victims of this area. A Hollywood Uber lawyer is supposed to take on these tougher cases and see them through until the end. And that’s exactly what our friendly, knowledgeable team does. No matter what the circumstances behind your accident, this Hollywood personal injury law firm can handle it. We’ve seen a rise in these types of accidents over the years, as more and more people reach out to services like Lyft and Uber in order to cut the cost of their transportation services and because they’re very convenient thanks to the applications they reside on. The first thing to remember when you’re in a rideshare accident is that you should never settle with an insurance company by yourself. Many people mistakenly think that Uber and Lyft aren’t required to carry insurance on their drivers, but in reality, they now carry millions of dollars worth of insurance on their drivers. Thanks to stiffer regulations, accident victims have a place to turn when they need compensation for things like medical bills, pain and suffering, and loss of wages. 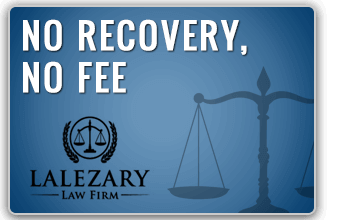 Our dedicated personal injury law firm is here to make sure that you get the max amount of money available to you under the law. Whether you need a Hollywood Uber lawyer or a Hollywood Lyft attorney, we’re here to serve you. We have a no recovery, no fee policy, so don’t make the mistake of thinking you can’t afford our services. We work for you free of charge until you win, and we’re proud to say that as a personal injury lawyer in Los Angeles, we have a terrific history of winning on behalf of our clients. If you don’t get paid, we don’t get paid, and not every Hollywood personal injury law firm can back up their facts with a fantastic history like this. As a Hollywood Lyft attorney and Uber attorney, we fight tirelessly for our clients. Your injuries, whether physical or psychological, deserve compensation. Let us sit down with you and discuss the facts of your case. Once you contact us, we’ll even come to you, whether you’re in a hospital or recovering safely at home. Our philosophy is always the client first mentality. Whatever you need us to do, that’s what we’re going to do, and we use every legal measure possible to make sure that Uber and Lyft drivers are held responsible when they cause damage to the lives of others. Call us today.